Ever since the chia seed landed on our shelves, we have had a hard time keeping them in stock! 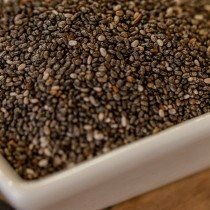 If you are unfamiliar with chia seeds, they are one of the newest diet foods on the market. The name may sound familiar, they are the same seeds that gave the popular clay figurines their name in the 90′s, known as Chia Pets. Little did we know at the time that these little seeds are packed with omega-3 fatty acids, age-defying antioxidants, and are a great aid to weight loss! When wet, the chia seeds forms a natural gel-like coating around it, increasing in weight and size. If you are trying to lose weight this is a huge benefit. When swallowed, the chia seed makes your stomach think that it is full because of the water based get surrounding the seed. And because the gel is water, it has no calories! It helps keep you hydrated, feeling full and gives you tons of energy. This superfood is packed with more than 8x the Omega-3′s found in salmon, 6x more iron than in spinach, and more calcium than in milk. It’s no wonder that more and more athletes and celebrities are adding the chia seed to their diets. Buy Chia Seeds from the Spice Hut!